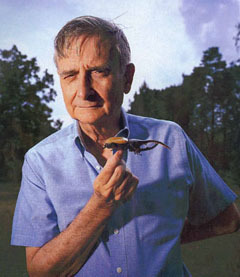 AKA Edward Osborne Wilson, Jr.
American entomologist Edward O. Wilson is a founder of the science of evolutionary psychology, and a renowned authority on sociobiology. He is the world's foremost expert on social insects, such as ants, bees, termites, and wasps, and — believing that no species, not even our own, should be excluded from evolutionary analysis — he has extended his field of research to include the role biology plays in the evolution of human society. His work suggests that human behavior, in the broadest sense, is a naturally selected result of the processes of evolution. Even charity, Wilson argues, may be a genetically-based attribute, and may have evolved through natural selection. Introduced in his 1975 book Sociobiology, such ideas were deemed controversial for their implied or inferred message of "biological destiny," and throughout the 1970s and '80s Wilson was criticized by Stephen Jay Gould and some other respected scientists. The basic premise of his research and writings in this area, however, have been increasingly accepted. In 1995, Time magazine named him one of the 25 most influential people in America. Wilson believes that the education of third-world women is crucial to saving the environment, as in underdeveloped nations better educated women could help control population growth. He also recommends smaller cars, increased water efficiency, and less meat-eating. His book Biodiversity introduced that term, and he has long been at the forefront of efforts to reduce human-induced environmental degradation. With population biologist Robert MacArthur (1930-1972), he developed a theory explaining the geographical distribution of species on islands.